This project was to revamp the Corporate Website for IMH, using design & visual elements to demarcate corporate information. Customized modules were also developed to meet their specific requirements. 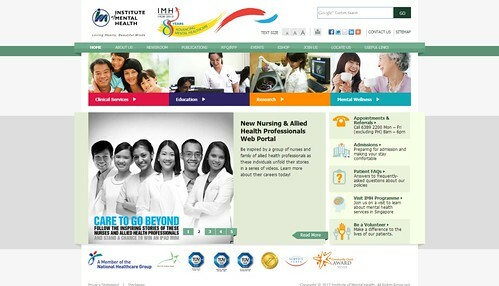 This project was to Revamp the Corporate Website for IMH or Institute of Mental Health. One of the most important tasks we had ahead when designing the website was to change the perception of the public about IMH. From our research as well as from talking to different division users from IMH, we identified the following core business units (the 'four pillars') of IMH; Education, Research, Clinical services and Mental wellness. The best way to communicate to the public about what IMH does was via a strong website design and very clear demarcation of the 'four pillars' together with insightful corporate information. When we started the design mock-up, we decided based on garnered public opinion that it was best to design the website with a concept of “Branded House” but with a clear difference for each of the different core business units. The best way was through carefully selected visual elements. The core information and the different core business units were designed with different coloured themes thus when a user browses through the website, the visual clues can help the browser know which section they are reading from. Our second challenge was conceptualizing an online shopping cart for one of the core business unit, which wanted to sell books, arts and crafts produced by the patients. However, this was not a typical shopping cart. This E-commerce feature was to be used primarily as a platform to advertise programmes, so we had to customize the E-commerce module to meet the organization's needs. During our requirements gathering sessions, we also found that IMH conducted events, training workshops and courses for health care professionals and that the top management wanted the website to be one of the mediums to communicate this information to the public as well as to allow the public users to register for the events and training workshops online. So the system was customized with an events module which would allow registration and payment for the events and workshops via the website. For the IMH website most of the modules and features were customized and had to be built to support multiple design templates to feature multiple themes according to core business needs.